Erik currently heads up Pareto Securities' activities in Asia as Managing Partner for the Singapore Office. Pareto's focus in the region is primarily within E&P, offshore and shipping, where it offers a full range of investment banking services. 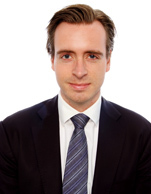 Before relocating to Singapore, Erik was a partner at Pareto Securities' main office in Norway, where he focused on offshore and shipping, across various disciplines, such as bond financing, equity private placements and M&A. Prior to his time at corporate finance, Erik worked within Equity Research, focusing on offshore, drilling and oil services. Erik has an MSc. in International Management from the London School of Economics.